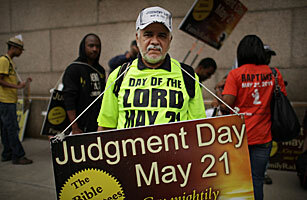 Osvaldo Colon walks the streets proselytizing with other believers that the world will end this May 21, Judgment Day, on May 13, 2011 in New York City. Harold Camping's biggest achievement wasn't calculating the exact time the world would come to an end last May. It was becoming a household name for millions of Americans who found his specific doomsday prediction the perfect water cooler conversation. Camping said he based his 6 p.m. May 21 prophecy on biblical calculations and a deeper understanding of scripture. He also said the time would be localized, cascading across the time zones. The only problem was that at 6:01, life went on as normal. Camping was left dumbfounded, leaving the public eye for a few weeks before returning with a second doomsday in October. When the Rapture again failed to materialize, he issued a full mea culpa and stepped down from his leadership role at the California-based Family Radio.